Onglyza is a Type 2 diabetes medicine that helps patients' bodies regulate the level of insulin produced after eating. Some recent studies suggest that it can increase the risk of chronic pancreatitis (which in turn causes pancreatic cancer) and heart failure. 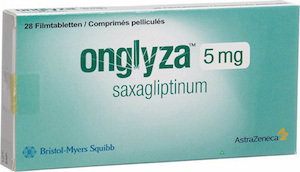 The manufacturers of Onglyza are AstraZeneca and Bristol-Myers Squibb. In 2014, the FDA issued a safety alert for this drug after the New England Journal of Medicine linked it to a 27 percent increased risk of heart failure. Our Onglyza lawyers understand that it is believed that the manufacturers may have withheld important information about these risks from doctors and their patients. If you developed pancreatic cancer or heart failure due to Onglyza or another defective drug, contact the products liability attorneys at Moll Law Group to represent you in seeking compensation. We represent consumers nationwide and have billions of dollars have been recovered in cases in which we were involved. Pharmaceutical manufacturers are responsible for making sure that their drugs are formulated to be reasonably safe and that there are adequate warnings when the use of the drugs carries risks of injury or illness. Onglyza is meant to improve quality of life and reduce the chance of heart disease in people who suffer from Type 2 diabetes. However, it is believed to cause heart failure. There are multiple legal theories that may be available to pursue damages for harm suffered because of Onglyza, including negligence, strict liability, misrepresentation, and breach of warranty. Generally, with each of these theories, your Onglyza lawyer will need to prove that Onglyza was dangerously defective, you were hurt, and your injury arose because of the dangerous defect. Most likely, design defects and marketing defects are implicated by the facts of the Onglyza cases. Design defects exist when a pharmaceutical is formulated in a flawed way. In some cases, manufacturers may know that there is an unreasonable risk of harm but intentionally conceal it until a replacement product can be made. In that case, punitive damages may be available. In failure to warn cases, a manufacturer may have failed to give accurate warnings to the doctors who prescribed the medication. Under the learned intermediary doctrine, followed by many jurisdictions, a manufacturer discharges its duties by providing accurate warnings to doctors and allowing doctors to look at the total circumstances for a particular patient to determine whether prescribing a medication is appropriate. Expert testimony is necessary in dangerous pharmaceutical cases. The expert must be qualified to give opinions on the drug in question. Generally speaking, trial courts are required to exclude expert testimony based on something that an expert may not reasonably rely upon, expert testimony that is based on reasons unsupported by the material the expert is relying upon, and expert testimony that is overly speculative. In an Onglyza case, it is important to retain an expert who has considered the available studies and can provide a reasonable scientific basis for the conclusions he or she reaches. If you suffered pancreatic cancer or heart failure while taking Onglyza, the products liability lawyers at Moll Law Group will assist you in pursuing damages. We bring these lawsuits throughout the U.S., including in states such as Florida, New York, California, Texas, Pennsylvania, Ohio, and Michigan. Call us at 312-462-1700 or complete our online form to set up a free consultation with an Onglyza attorney.